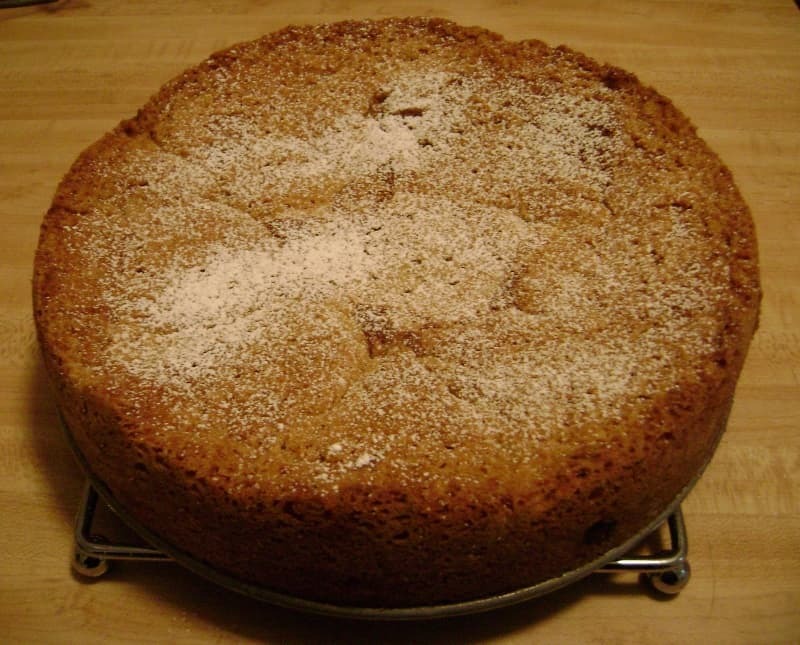 I’ve bought pears relatively often this winter, and so I was excited to come across the recipe for Bittersweet Chocolate and Pear Cake again. Although I enjoy eating pears fresh and roasted (which I do a lot), it’s nice to come across other things to use them in. And we all know of my love of baking and desserts. Today’s cake is a foam cake; much of the cake’s structure is provided by eggs. I was excited to make it after having relative success with the egg-based, flourless Heavenly Chocolate Cake Roll. Although this cake isn’t flourless, it only takes 1 cup of flour since the whipped eggs provide structure. What makes this cake somewhat easier to make than other foam cakes (including the Heavenly Chocolate Cake Roll) is that you whip the egg whole for several minutes to thicken them, rather than beating them separately. For full instructions, see the recipe over at Smitten Kitchen, which I’ve linked to above. I’m just going to walk through what I did, and how we liked the cake. First, I used my stand mixer to beat 3 room-temperature eggs on high speed with the whisk attachment. The recipe said it would take 9 minutes to make them very thick, which it did. The nice thing about using the stand mixer is that it frees me up to do other things in the meantime. While the eggs whipped, I melted 1 stick of butter in a skillet over medium heat and let it brown. I didn’t stir it much as I browned it, but I did scrape the bottom toward the end. I was surprised at how good the browning butter smelled, because I distinctly remember candy-making with butter to not smell particularly good. Once the eggs were thick enough, I slowly added sugar and whipped the mixture for a few more minutes. I was supposed to add 3/4 cup sugar, but I didn’t consult my recipe and added a full 1 cup instead. (Oops.) I let my attention wander from the stand mixer for a few seconds, and I think the mixture began to lose volume in the meantime. I turned the speed down to low, and added the slightly-cooled browned butter, and flour, baking powder, and salt, in batches, mixing until just barely combined. I used a rubber spatula to carefully fold in the flour from the sides of the bowl. I wanted to be careful not to deflate the eggs. I poured and scraped the batter into a greased and floured 9-inch springform pan. I put 3 diced pears on top of the batter, and sprinkled it with chocolate chips. I only had 1/2 cup of regular chocolate chips (how could I have run out of chocolate chips!?) so I supplemented them with 1/4 cup mini-chocolate chips. The instructions said to bake in a 350F oven 40-50 minutes, until a toothpick in the center comes out clean. Perhaps because of the additional sugar, I had to bake my cake longer before a toothpick inserted in it came out clean – this baked a whole 60 minutes, maybe a few more. The center of my cake was a little gooey, even though I thought I had baked it long enough; the moisture from the pear may have influenced the batter around it, making the bottom extremely moist as well. (Some of the comments at Smitten Kitchen suggest using not-quite-ripe pears.) The top and edges were sandy and flaky since more of the moisture baked out of it. This cake smelled amazingly rich as it baked. The browned butter made the apartment smell like butterscotch. I’m not afraid of tasting raw cake batter, and the browned butter made the batter very rich as well. It gives the cake depth of flavor, even though there’s no vanilla in it, and makes it delicious. This is the first time I’ve been sold on browned butter. This cake is delicious, but I just don’t get a lot of pear flavor in this recipe. Alex said he mostly likes the cake for the chocolate, and I agree. Chocolate bites are delicious. I really only get the texture of the pears, and I feel like I could be eating any anonymous fruit. Perhaps it was because I used Anjou pears rather than some other variety. If you left the skins on the pears, or used a more assertive variety, you might get a stronger pear flavor from this cake. As it was, I felt like the cake would be just as good, or better, without the pears. I’m willing to try it once more in the future to see if I can get a cake with a stronger pear flavor. 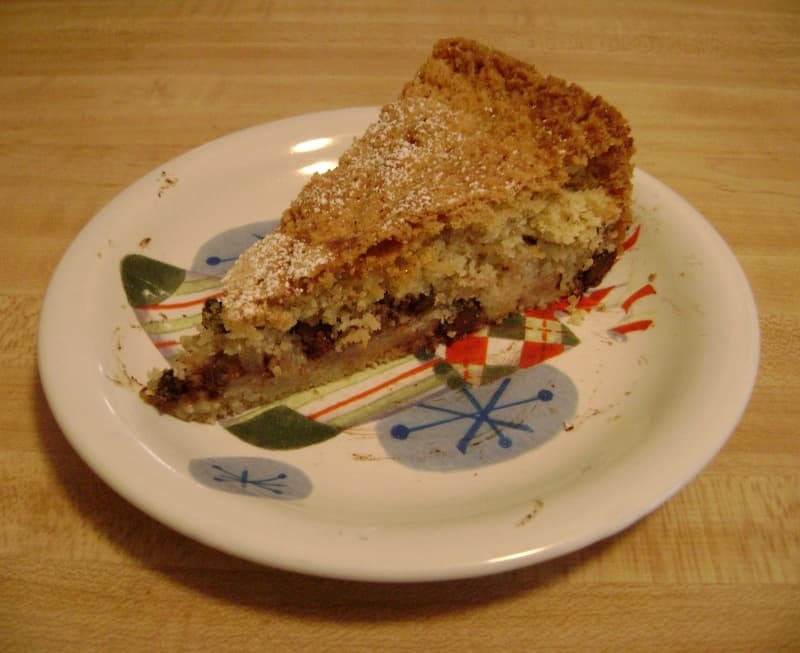 Otherwise, I may just start making this as a browned butter cake with chocolate, because it’s delicious as that.